Following Little Otter's address, Bacon returned to Detroit. The missionary next tried to spread Christianity's influence among the Chippewa Indians near Mackinaw. Although he spent two years here, Bacon had no success among the Chippewa. In 1804, the Congregationalist Church made Bacon the minister of a church in Hudson, Ohio. He also was to travel throughout the Connecticut Western Reserve, continuing his missionary efforts among both whites and the Indians. The Congregationalist Church also authorized him to establish the town of Tallmadge, Ohio. The church building was to be located in the center of town with all roads radiating outward like the sun's rays. Bacon constructed one of the first cabins in Tallmadge for his family and moved there in July 1807. By February 1808, only two other families -- one English and one German -- had joined the Bacons. Bacon spent 1808 recruiting more members for the community. He was away from home for extended periods of time. Fearing the Indians, Bacon's wife pulled in the latchstring on the door to make access into the cabin from the outside more difficult and she blockaded the door of the cabin. 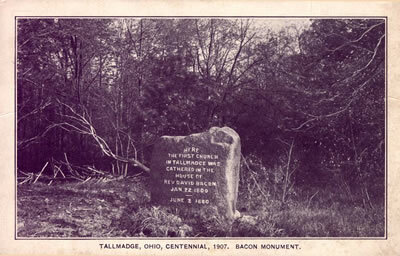 Bacon had limited success in finding new residents for Tallmadge. By the end of 1808, only twelve families called the town home.